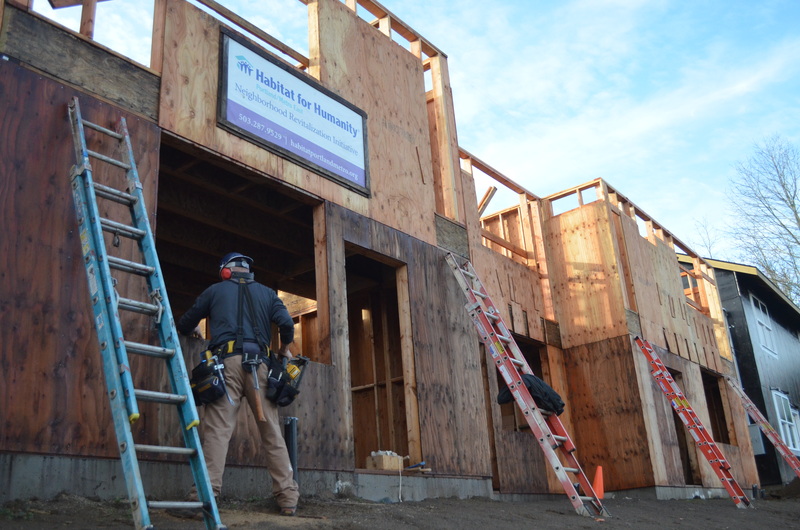 With the brisk winter season nearly upon us, construction at our Cully build site is ramping up in preparation for Energy Star Certification. Two units in Phase 1 have electrical and plumping completed and all three are framed with roofing nearly finished. Now, the focus is on Unit D, where construction crew members and volunteers are working on tightening up the house, drying it out, and filling penetrations so the entire space is above code. In addition to weatherization methods that keep homes strong, it also cuts costs to homeowners’ energy expenses. By using such techniques as properly creating effective insulation systems and maintaining tight construction, our certified homes can save much more energy cost than an average built home. One of the next installations will be a community dry well – an engineered feature that allows rainwater from roofs to drain into a single well. By managing the storm water on-site, it will prevent homeowners from paying utilities for off-site storm water management. Not only is this cost-efficient, it is environmentally conscious as well – just one of the many techniques Habitat for Humanity Portland/Metro East utilizes in order to build louder.